The technology group Wärtsilä launches a product at Slush Helsinki 2018 that should never see the light of day: a lifeboat for buildings. 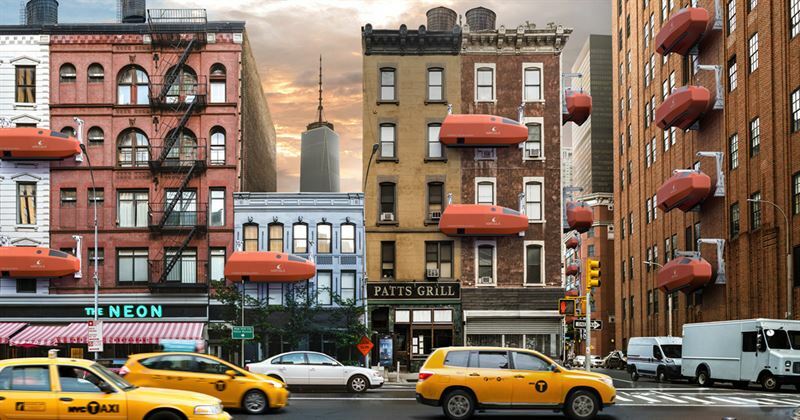 The lifeboats could be used in severe flooding and rising sea levels caused by climate change. The lifeboat for buildings is not a real product, even though it could be. It is conceptualised and designed by Wärtsilä Ship Design and features Wärtsilä’s world-class smart technologies from both Marine and Energy, such as autodocking, dynamic positioning and wireless charging. The autonomous lifeboat is powered by 100% renewables, like synthetic renewable fuels and solar energy. “This hypothetical lifeboat is a way for Wärtsilä to amplify the critical need to move climate change discourse to action. In fact, the concept is not as unimaginable as we first think. The boats would have been useful in the recent floods in Italy and Indonesia. We must act now, together. Or the unthinkable will happen and this lifeboat will have to be built for real,” says Marco Ryan, Chief Digital Officer. This year in Slush we are looking for partners to build a better world with a call to action ‘Let’s change the course of the future’. “This is an open invitation to start-ups, partners, customers and future colleagues. We are eager to collaborate with tech-heads around the globe and across industries to find smart solutions for energy and marine. We are after perfect matches in Slush,” says Steffen Knodt, Director Digital Ventures. “We simply cannot afford to wait for the marine and energy industries to improve at the current pace. Climate change and scarcity of natural resources call for innovative and creative solutions that Wärtsilä is already developing, but we cannot deliver our purpose ‘enabling sustainable societies with smart technology’ without equally forward-looking partners”, emphasises Wärtsilä’s President & CEO Jaakko Eskola. Wärtsilä’s commitment to sustainability is proven by an extensive portfolio of environmentally sound products and solutions that enable our contribution to positive global development. “Technologies play an important role in the mitigation of the impacts of climate change. Sustainability has been at the forefront in everything we do for decades. Our sustainability targets call us to reduce our own energy consumption by 7% by 2025 and reduce greenhouse gas emission from gas engines by 15% by 2020. These goals among others need to be achieved in order to avoid a future where lifeboats for buildings are needed,” says Marko Vainikka, Director, Corporate Relations and Sustainability. In Slush 2017 Wärtsilä launched a five level Tiered Venturing Model and SparkUp Challenge for start-ups. The first round of the challenge was Smart Marine and winners of the second round, Smart Energy, will be chosen in the SparkUp Challenge Day in Helsinki in January 2019. Wärtsilä’s President and CEO Jaakko Eskola is available for Slush interviews at the Wärtsilä booth 7A.2 on Wednesday 5 December between 10–11 AM. Wärtsilä’s CDO Marco Ryan is available for media all day 5 December at Slush. Wärtsilä’s Director, Digital Ventures, Steffen Knodt and Vice President, Open Innovation, Alid Dettke are available for media interviews on both days upon request. Please contact Jenita Cresswell for interview requests.